I have a job I ADORE but it’s completely unrelated to my degree (and doesn’t require a degree) and I haven’t done any real web development in years. I have only a passing knowledge of how people build good websites nowadays. It’s bizarre how fast the industry moves. A while back, I spent a year at a job I hated where they stuck me with in-house PHP work versus the client-side HTML/CSS work that I enjoy, and I feel like in that time, mobile development (as a skill) passed me by entirely. I did my best to learn on my own, but with nobody to bounce ideas off of and no client work to force me to get it right, I just hoped I was on the right track. I didn’t even have a smartphone at the time so it was difficult to assess my efforts. Anyway — I feel like I don’t know where to start with web dev anymore, even for hobby stuff like this ancient website. (Side note: did you know that I bought this domain in 2003? Yipes.) That said, CSS has always been fun for me so I might experiment with bringing this WP theme into the current decade. I feel like I’ve had a pretty chipper attitude toward my leg/ankle breaking and me missing out on fun derby stuff, but this week all my teammates started receiving their official new uniforms in the mail and I am so jealous!!! Argh. My profile picture all over the Internet. 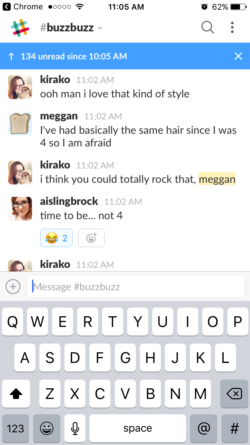 “Time to be… not 4.” Thanks, Aisling! Just prior to cutting my hair, I attempted to come out to Daniel as bisexual, and he sort of laughed and said he’s known that about me for forever. May everyone have a partner as supportive as Daniel. I’m still figuring out how to navigate being very hetero-passing due to marriage/kids but wanting to be visible as a bi person! It’s a weird place to be in! I don’t have all the answers yet, but I have a deep and abiding gratitude toward my bi friends who have come out publicly recently and who have given me the courage to start saying some stuff out loud. I am also grateful for Whip from my derby team exclaiming at an afterparty that this was “the gayest team we’ve ever had,” and then pointing out all the queer team members before turning to me and saying, “…and I don’t know you very well but you have a gay haircut so…” I felt so SEEN. Haha! 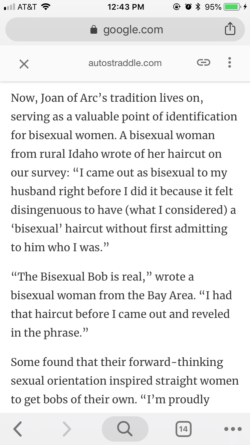 In other hair news, a couple of months ago I got anonymously quoted in an Autostraddle article about the bisexual haircut so *hair flip* it’s almost like I’m famous. 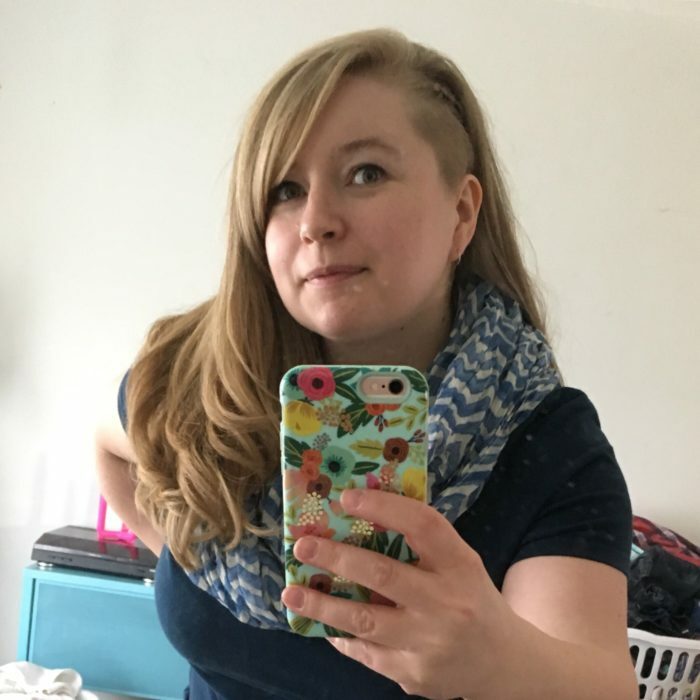 In an earlier version of the article, they left in my description of my long hair + side shave, but then edited it out to better fit the bisexual bob theme of the article. Wesley is in third grade and is about to turn nine, and Thora is four and will go to kindergarten in the fall. She can read already, and is whip-smart and more clever than you’d expect. Classic Slytherin. Wesley is a Hufflepuff and is such a thoughtful, kind boy. For as much as I loved the baby stage, I’m really enjoying having older kids. They’re funny! They’re able to help around the house! They can buckle their own carseats! Many advantages. The Gentleman’s Guide to Vice and Virtue by Mackenzi Lee. Easy, entertaining read? Explicitly bisexual main character? Adventure and mystery and some very hot flirting? SIGN ME UP. The sequel (from the sister’s perspective) is also excellent. So You Want to Talk About Race by Ijeoma Oluo. Recommended reading for all humans. The Radium Girls by Kate Moore. Depressing but fascinating look at how dangerous stuff gets passed off as “perfectly fine” if people can still make money off of it. I also re-read the first two Grishaverse books by Leigh Bardugo so I could make sense of the third one, Ruin and Rising, and MAN I had forgotten how much I enjoy her stuff. I then went on to read the other Grishaverse books that are out now – The Tailor, The Demon in the Woods, Little Knife, and The Too-Clever Fox. I also read Six of Crows and am excited for the sequel to come out. I went to a movie by myself for the first time ever – I put on some red lipstick and took myself to see Wonder Woman. I cried in the theater during the “No Man’s Land” scene like everybody else did. I can’t even describe why… Something about her body positioning and what she was doing and GAHHH I ended up buying a digital copy of the movie and I can’t watch it without getting a little misty-eyed at that part! I also took myself to Thor: Ragnarok because HELLO – Tessa Thompson and Chris Hemsworth! I haven’t seen really any of the other Marvel movies besides the first Thor movie but you know? 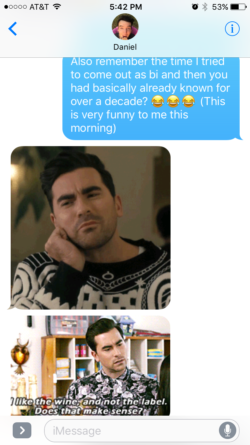 Sometimes you just have to trust in Taika Waititi and you’re not disappointed. I’m very interested in the new Men In Black movie starring the both of them. TV-wise, obviously I am currently obsessed with The Magicians, but I also love Sense8 and am super sad it’s done but grateful we got to get a conclusion with that special episode they put out. I like Marvel’s Runaways, and I have a love-hate relationship with Riverdale. It’s like a horrible soap opera and it’s objectively terrible but also amazing and I love it? I think? Except Archie was recently bucking bales of hay shirtless which is I think the stupidest thing I’ve seen on that show so I’m still recovering from that scene. In 2019 I’m trying to lean more into the interests I’m a little embarrassed by, so I’ll probably be tweeting and/or posting more about TV and makeup/skincare and pop music and other things because I LIKE THEM and I usually talk myself out of posting about them but man do I have a lot to say about media sometimes. When we left off, I had arrived at home from the Emergency Room in the wee hours of the night. I was so hopped up on adrenaline that I never did end up falling asleep that night and stayed awake for the entire next day. I mostly spent the morning responding to DMs and text messages. Once clinics were open, I began making phone calls. First, I called the orthopedic surgeon that the ER referred me to, but they told me that due to my insurance, I needed my Primary Care Provider to refer me to them – the ER wouldn’t cut it. I made a call to my PCP and had to leave a message. They took a while to call me back, and referred me to a local orthopedic surgeon affiliated with the only hospital in town. I actually preferred this, since I didn’t relish the idea of having to travel an hour each way to see the ortho that the ER recommended. 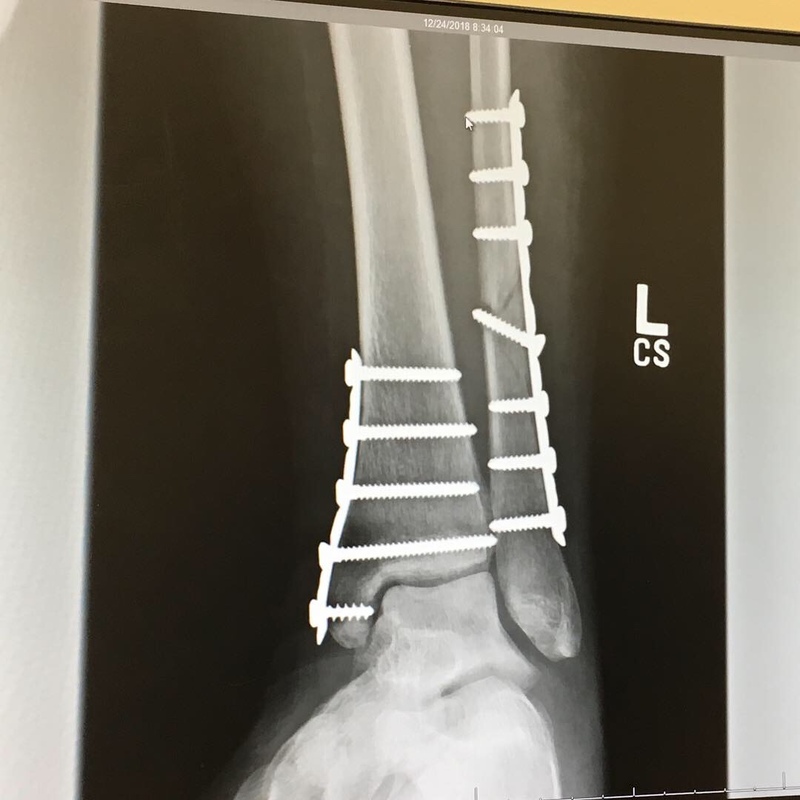 I was told to wait a couple of hours and then call the orthopedic surgeon’s office to make a plan for surgery – my PCP had already sent over my x-rays. I waited approximately half the time they said and then called. It took them THREE HOURS to call me back, and when they did they asked if anyone had called to schedule me yet. I replied that they had not, and they told me their weekend on-call orthopedic surgeon was super backed up in the operating room, but once he was out of surgery he’d be calling me himself to make a plan. Up until this point, I was still assuming I’d be able to see a doctor that day. Once it was getting close to the end of the business day and I was facing the prospect of a weekend full of long, painful nights, I started to despair. HOURS later, at 8pm, the orthopedic surgeon finally called me. He said I needed surgery for sure, so rather than having to call their office on Monday to schedule, he advised I just show up Monday morning (reminder: I was speaking with him on a Friday night) for an appt and then we’d see about putting me on the surgery schedule. During this terribly long wait for an update, I had a really poorly timed bathroom break and ended up crying the entire way back from the bathroom to the couch. Using crutches was really difficult, as the splint from the ER went up and over my knee and was very heavy. I had not cried up until this point, so you know it was bad. After that experience, I figured out that I should time my bathroom breaks to be approximately an hour after taking medicine but not less than an hour or two before needing to take them again. It was a short window of time! I also almost passed out once on the way back to the couch – it was early in the morning and Daniel was taking me before he left for work, and I had to sit in a chair and then needed him to hang on to me in case I blacked out. I didn’t, ultimately, but everything went fuzzy and I definitely came close. On Saturday, I began to do some insurance-related research. The weekend on-call doctor I’d been assigned wasn’t familiar to me (I live in a very small town. We know who the local doctors are!) and when I attempted to look him up on my insurance’s website, he was not listed as an in-network provider even though all his coworkers were. Knowing that my out of network deductible was FIFTY THOUSAND DOLLARS (because the United States is a backwards hellhole that doesn’t have universal healthcare), I promptly panicked. I called the orthopedic surgeon’s office and left a very tightly-wound voicemail indicating I liked the doctor when I spoke with him on the phone, but for insurance reasons I had to see somebody else. I said he wasn’t showing as an in-network provider and if he’s not in-network, my deductible is astronomical and there’s no way I can be on the hook for the full cost of my surgery. I wasn’t allowed to eat or drink after midnight on Sunday in case they decided to go ahead with surgery. I showed up Monday morning and as we were parking, I saw I had a voicemail from their office. In it, the admin assistant acknowledged she’d received my call about wanting to switch providers for insurance reasons, and wanted me to know that even though he shows as out of network, it’s only because he’s new to the practice and he’s actually contracted with all the same insurance companies his coworkers are. NOTE: I know I have several non-US readers, so if this insurance stuff is confusing, I’m so sorry and it’s confusing to all of us too. 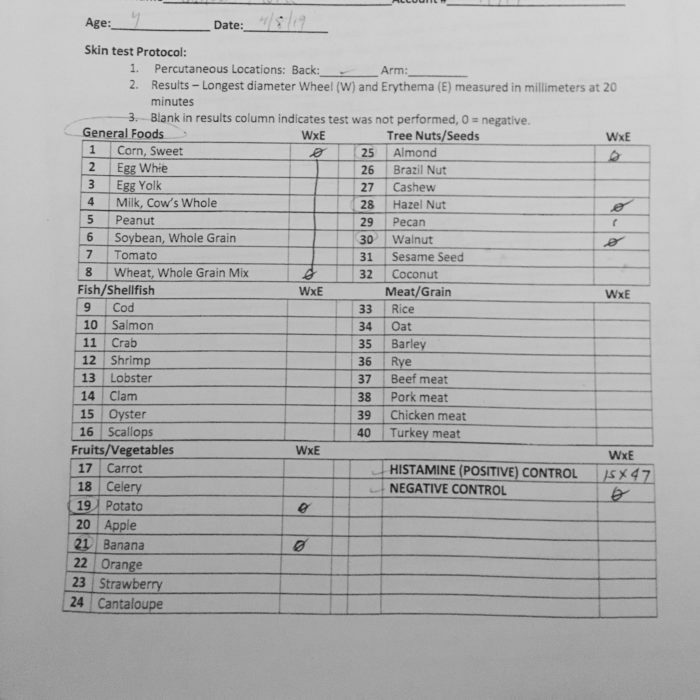 Once I was taken back to the exam room, I kept telling Daniel that I cannot let this guy so much as LOOK at me or else I will be on the hook for everything out of pocket. The sad thing was, I really liked the doctor! (We’ll call him Dr. K.) Daniel asked if I wanted him to talk with the front desk and I said YES, so he went to do that. Dr. K came in and I said the same thing to him – it’s not about YOU, it’s just that you’re not listed on my insurance. He reassured me it was fine and that he’s on all the same insurances the other doctors are. Daniel came back and said the front desk told him they’d spoken with my insurance and it was all fine. I wasn’t sure I believed them, but I was in pain and had been suffering with a very broken leg at home for four days and I was ready to get this show on the road. Dr. K scheduled my surgery for that same day at noon, and we headed to the hospital. My mom’s cousin (“Aunt K”) was my pre-op nurse, which could sound embarrassing but was actually really comforting. It was nice seeing a familiar face! I also liked my anesthesiologist and we talked about how we both used to live in Portland. I had to have blood drawn for a pregnancy test even though I have an IUD and Daniel has had a vasectomy but AN ABUNDANCE OF CAUTION I guess. They gave me an IV and placed a nerve block for my leg, which is kind of like a leg-specific epidural that goes in the back of your thigh, close to your knee pit. The only terrible part of the whole ordeal was in the operating room as they were trying to knock me out. They applied an oxygen mask and told me to breathe deeply and count backwards from ten. As they were saying this, they pushed something cold through the IV in my hand. It was so PROFOUNDLY painful that I screamed and burst into tears and so the last thing I remember before going under was me scream-crying and someone rapidly telling me to keep breathing so I’d go under faster. 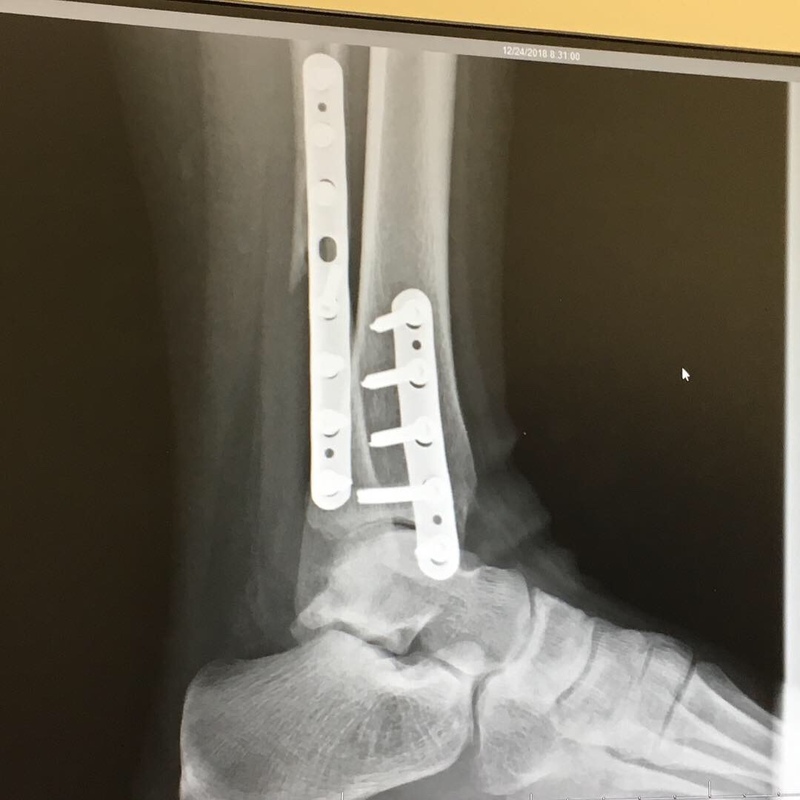 Happily, I woke up a while later with a repaired leg and ankle and the news that Dr. K didn’t have to put in removable pins to hold my tibia and fibula together, meaning this surgery was one-and-done and I wouldn’t have to have a followup surgery to remove anything. Yay! Daniel told me my surgery took about three hours. Aunt K was also my post-op nurse, and she took great care of me while I recovered. I did need some anti-nausea medicine at some point because I felt gross, but recovery was pretty uneventful. I mostly had to pee a lot! 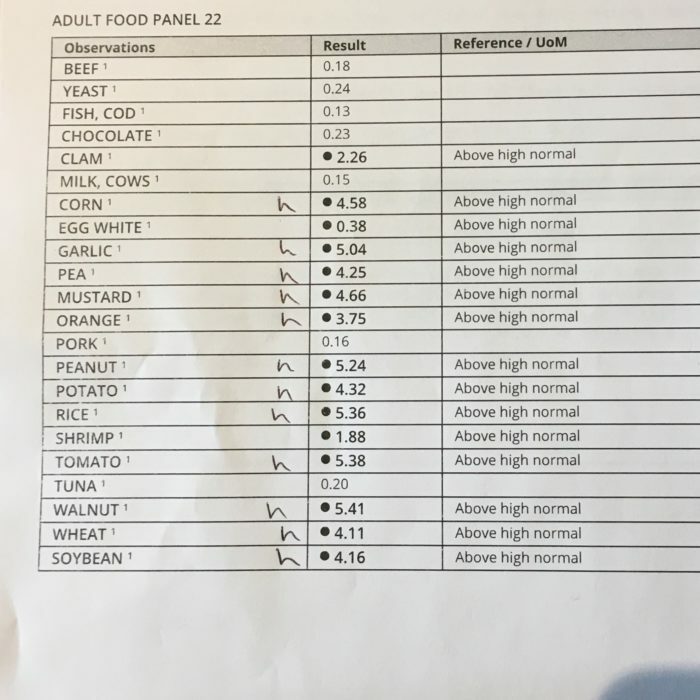 I munched on some crackers and toast and eventually felt good enough to leave the hospital. The next few days were a blur of round-the-clock babysitting since I couldn’t get my leg on or off the couch by myself for bathroom breaks. Thora also came down with some kind of barfing sickness so not only was I completely non-functional, anybody who babysat me had to be willing to enter a house with barfing child germs. We went through a lot of Clorox wipes that week. I was instructed to be completely non-weight-bearing for six weeks, so Daniel’s mom brought over a hard plastic school chair with wheels and it changed my life! I could sit and be pulled to the bathroom instead of having to crutch there! Later, she brought over a walker – one of the fold-up ones with a little seat that elderly people use to get around. I would sit on it and scoot backward through the house. (This is not its intended use, and it specifically advises against doing it on the walker, but it worked really well for me!) I cannot overstate how revolutionary this walker has been for my recovery. It has gone with me everywhere and I love it. In total, I spent three unpaid weeks off of work, mostly sitting at home on the couch. I didn’t watch much TV; it felt too busy. I also didn’t feel like I had the concentration for books, so I spent a lot of time on social media. I tried not to do much online shopping. One of the biggest struggles I had was with hygiene and self-image. The idea of showering with my enormous splint was so daunting – our house doesn’t have a bathtub, just a single standing shower stall, so space was an issue and I was terrified I’d accidentally get my splint wet and have to go in to get it replaced. I did a lot of awkward sponge-baths with soap and a washcloth. Daniel kindly washed my hair in the sink. I was living in men’s sweatpants that we cut off at the knee for my splinted leg and at the ankle for my non-injured leg. I had a hard time wearing underwear since my regular cotton ones wouldn’t stretch over my splint and the synthetic underpants I had made my skin hurt. I just felt so gross all the time. Unwashed! No underwear! Men’s sweatpants! Dirty hair! Ugh. I had a followup appt two weeks post-surgery. They took my splint off, and I got to see my repaired leg for the first time. I was told my incisions looked amazing and Dr. K was really pleased with how I was healing. I received a walking boot (not for walking though!) and instructions to not put any weight on that leg until my next appointment six weeks from then. Front view showing the two plates and twelve screws holding everything together! My X-rays looked great according to Dr. K so I was told I could start putting weight on my leg again! My instructions were: wear the boot for walking for four weeks; you can take it off to sleep (GAME CHANGER); after the four weeks, you only need to wear it if you’re going to be going outside because it’s snowy and icy. Whew! Once I was allowed to put weight on my leg, I felt like my recovery really sped up. I’m still using the boot, but I can hobble around the house without my walker for short distances. Lately, I’m noticing if I spend too much time upright or walking without my walker, I do get some swelling/pain under my skin, almost like the screws are irritating it from the inside. It looks completely normal from the outside (no redness or anything scary) but feels like a bruise. Kind of wishing I had Dr. K’s email address to ask him if that’s normal… maybe I’ll call about that tomorrow! There’s a lot of stuff I’ve failed to document here (like my whole pain medication saga) but this is basically the gist of it all! It’s been such a wild ride. So many of our family and friends have supported us throughout my recovery, whether it was bringing meals or babysitting me or babysitting the kids and I’m so grateful for all of that and everyone who reached out to me over social media or via text! It’s been a pretty lonely recovery (I haven’t been anywhere besides work, parents houses, and my doctor’s office since Nov 1st) so my “pocket friends” have been a lifesaver. I’m also happy to answer any questions you might have about any broken leg or ankle-related topics – I’m pretty open about my recovery!